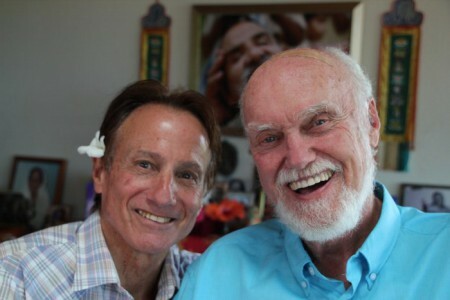 Ram Dass, author of the famous book Be Here Now, and one of the most beloved spiritual figures in our era, has gifted his teachings of loving service, harmonious living practices, and conscious care for our elders to millions of people. For four generations, his luminous spirit has inspired the path of a spiritual journey for countless souls, including our very own Bhakti Fest Founder, Sridhar Silberfein. 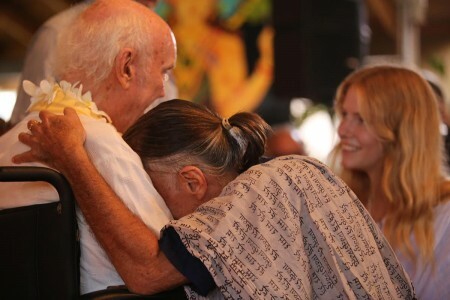 On my annual retreat in Maui to visit Ram Dass, I merged into the arms of my dear friend. I instantly recalled the many years of our close relationship since 1970. It wasn’t so long ago that I moved him from Northern California to Maui on the pretext of doing a retreat with him. Once he arrived, I witnessed his deteriorating health. I immediately did what I would call a “spiritual intervention”, by refusing to let him go back to a dysfunctional community. I got him the best doctors and practitioners on Maui, found a suitable home for him, and proceeded to raise some funds with the help of the late Dr. Wayne Dyer. This gave us a beginning, and settled him into what is now a very healthy, sweet and compassionate lifestyle for him. However, like everything else, it took a major step to make it happen. By putting myself in a crib of immense challenge, I understood the will of doing the right thing superseded anything else. What this has taught me is, you have to realize the importance of right association, of right action, of bhakti flow, of doing what you feel is right beyond any other objections and agenda’s…just do the right thing for everyone– you also have to remember that everyone has an agenda, and it’s mostly their own. So tread carefully, and mindfully. Know who your true friends are, and spend time in solitude, or with spiritual elders, and read important texts. Let’s make this year the best ever– peaceful, kind, loving and in the utmost of service. Let’s look at each other for who we are today, not reflecting on the past or anxious about this or that in the future…we all have past histories of good and not so good, of treating each other with love and not so much love– but life is about forgiveness. Let’s all forgive each other for past indiscretions and ask for forgiveness in everything we do. Wake up each day and be thankful we are alive, and have another day to be of service. This year promises to be an amazing year for Bhakti and Shakti Fests. We have all-star line ups of teachers, sacred music leaders, and world teachers of dharma. Thanking you kindly for your generous support.